Laminar Flow Fume Hoods offer excellent protection of equipment and materials inside the cabinet from particulate contamination. Negative pressure flow protects workers from hazards like anthrax, explosives, fentanyl or pharmaceuticals shipped in packages or envelopes. during manipulation and transfer of potent compounds. The Primary Barrier for Research and Experimentation. The Purair BIO minimizes and contains Biosafety Level 1-3 agents, maintaining negative pressure inside the cabinet to prevent contaminants from escaping the work area. The EDU? 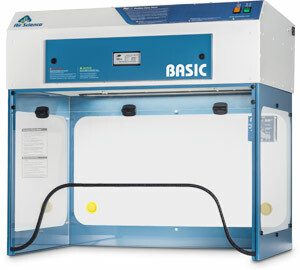 Series Ductless Demonstration Fume Hoods are designed to provide 360? visibility, while protecting users and the classroom environment from hazardous vapors generated on and above the work surface. The Purair? NANO ductless enclosure is designed to contain nanoparticles and fine powders of <100 nm. Air Science was great through the whole process! The sales team that sold the product worked with our City to get what we needed for a price we could afford! The hood was easy to set up and is even easier to use! There were a few questions during the initial set up and with one phone call we were up and running very quickly. I cannot put a price on our safety while testing drugs, but I would say the value for the money is beyond measurable!